Yes, both the half marathon and Redmond Town Center Family 5K are USATF certified. How do I pick up my Labor Day Half shirt, timing chip and bib? 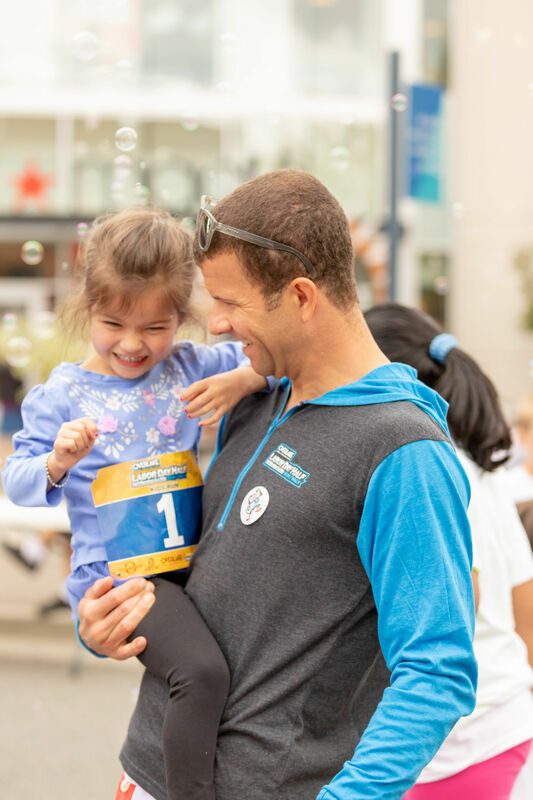 Online and mail-in registrants will be able to pick up their event materials Sunday, September 1 at Super Jock ‘N Jill in Redmond from 10:00am-2:00pm or on race day at event registration on Monday, September 2 beginning at 6:30am. Can a friend or family member pick-up my packet for me? Ample FREE parking is available at Redmond Town Center. Please plan to arrive early and follow directional signage and parking attendants on event day. Race participants and spectators are not required to have a parking permit. Yes, you can register on race day at event registration Monday, September 2 beginning at 6:30am. *On-site registration for each race will close 15 minutes prior to the start of the race. Where can I leave my stuff while I’m running/walking? Gear can be checked at Redmond Town Center in the start/finish area Parks, and picked up in the same area until 1pm. Items will only be accepted in the provided bags provided by the event, and only checked for participants with a valid bib. The Labor Day Half race crew reserves the right to refuse gear check to any participants. Please leave all valuables in your car, the event will not be responsible for any “gear” checked including wallets, keys, cell phones, iPods, etc. Thank you for understanding. Will there be a time limit? Yes, there is a 4-hour time limit and the finish line will close at 12:00pm. Will there be race awards? Top 3 Overall Male and Female for both the half marathon and Redmond Town Center Family 5K will receive a gift card to Super Jock ‘N Jill. Overall Male and Female Masters Winner (40 & up) will receive a Super Jock ‘N Jill gift certificate. Age group award certificates will be available for all participants in the form of a printable certificate. Are strollers and baby joggers allowed? 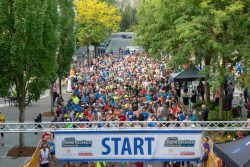 Strollers are not allowed on the half marathon course but are allowed in the Redmond Town Center Family 5K. 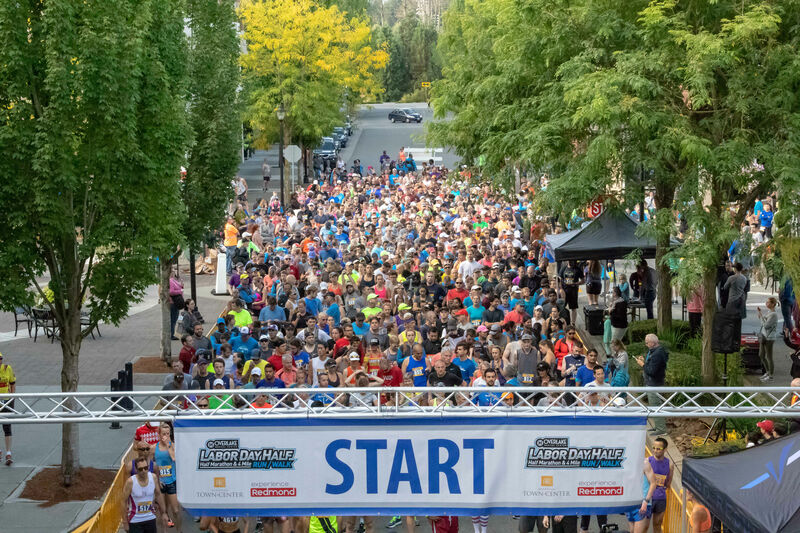 Baby joggers with hand brakes and safety harnesses or hard-shelled helmets are allowed in the half marathon walk and Redmond Town Center 5K. Participants running or walking with a stroller will be required to queue up toward the rear of the field to prevent potential incidents and minimize congestion near the crowded start line. Please be respectful to passing runners and walkers and remember to stay to the right along the route. Registration fees are non-refundable, non-transferable and are not tax-deductible. Once your registration has been received and accepted, you will not receive a refund if you cannot participate. If you registered and are unable to participate in the race, please e-mail info@orswellevents.com and include your name, address and shirt size. Running shirts will be mailed approximately 4 – 6 weeks after the event. Dogs, skates, bicycles, skateboards, wagons, segways and similar wheeled devices are not allowed in any of the events.